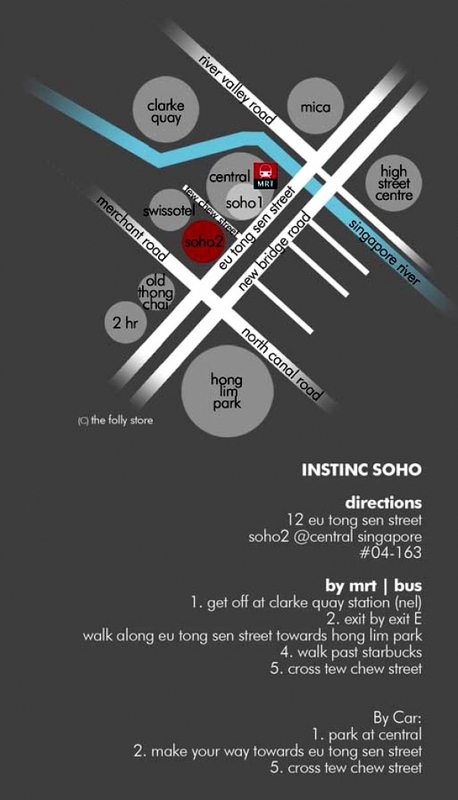 By Train: Take the North-East Line and hop off at the Clarke Quay MRT Station. By Bus: Bus services stops along Eu Tong Sen Street, directly in front of Central. Bus Nos. 2, 12, 33, 51, 54, 63, 80, 124, 145, 147, 166, 197, 61, 190, 851, 961, NR 1, NR 2, NR 3, NR 5, NR 6, NR 7. By Taxi: Stop at the intersection of Tew Chew Street and Eu Tong Sen Street. Just before Swissotel Merchant Court Hotel. Please locate the lobby of soho2 and once you get there, use the intercom and press 04163 and then the bell button, go to the lift on the left. Once in the lift, press 4 to go to level 4. If there is problem, pls call us direct at 6227 9487. We will be happy to bring you up personally.